We had a Hail and Farewell tonight, and one Captain was cooking all the food for 90 people. So when I offered to make a dessert, he said to bring cake–and suggested Red Velvet. 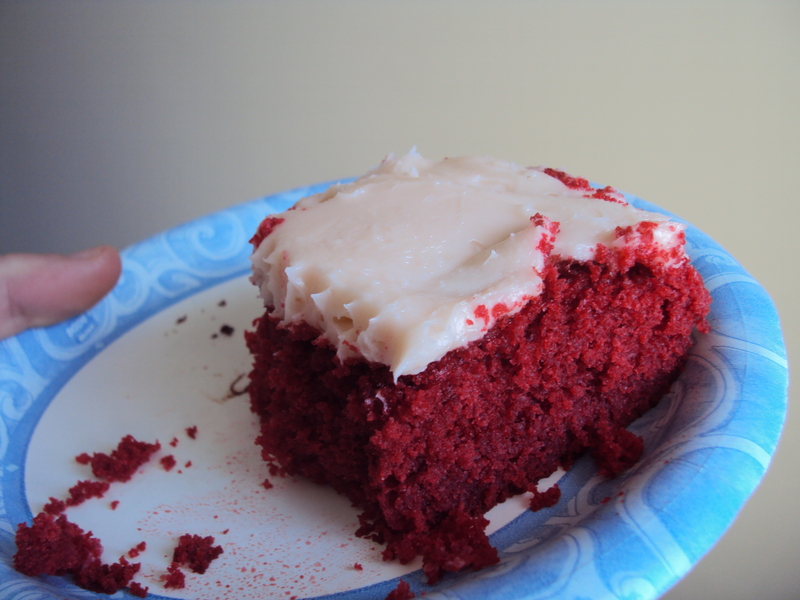 I’ve had Red Velvet once before but I thought it was just white cake with red food coloring, but it actually has a different consistency–and a little cocoa powder. So I looked around Foodgawker and found this recipe. I’ve used her Irish Car Bomb Cupcake recipe to the immense satisfaction of my coworkers, so I took her Red Velvet recipe and made a sheet cake out of it. Everybody loved it. I thought it was good, but I don’t have much to base my judgment off of. EDIT: I also used this recipe at Thanksgiving, but used butter. It worked just fine. I was worried at first because when you use butter, the butter won’t really get smooth (probably because of the vinegar curdling it or something), but once you mix in the dry ingredients, it doesn’t matter. -I didn’t bother buying my own buttermilk because it’s easy to make with just milk and vinegar (see the *’d note at the bottom). -I used olive oil the first time and butter the second time. Olive oil gives it the slightly nutty taste of baked olive oil, while butter works just fine. I prefer butter just because. Preheat the oven to 350° F. If making cupcakes, line cupcake pans with paper liners. If making sheet cake, grease and sift a little flour into a sheet pan (this just keeps the cake from sticking. It’s unnecessary. I use the butter wrappers so you may as well…). In a medium bowl, combine the cake flour, sugar, baking soda, cocoa powder and salt; whisk to blend. In a separate bowl, combine the eggs, oil/butter, buttermilk, food coloring, vanilla and vinegar. Beat on medium speed until well blended (it won’t really blend if you use the butter. As soon as it’s smooth, it’ll separate again. Don’t worry about it and continue with the dry). Mix in the dry ingredients on low speed and beat until smooth, about 2 minutes. Divide the batter evenly between the prepared liners or pour it into the single sheet pan. Bake, rotating the pans halfway through baking, until a toothpick inserted in the center comes out clean, about 18 minutes (probably more like 30 for a sheet cake). Let cool in the pans 5-10 minutes, then transfer to a wire rack to cool completely. NOTE: cream cheese frosting is much better if you use cool cheese and cool butter. It’s much harder to make by hand, but the consistency is worth it! Put vinegar/lemon into 1 cup measuring cup. Add milk to complete 1 cupful. Let stand for 5 minutes. Utilize.